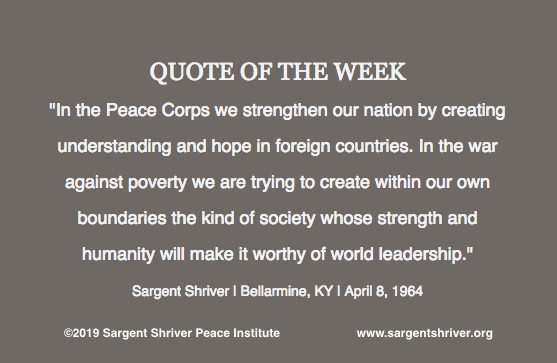 In our Quote of the Week, Sargent Shriver describes how the the US can create a strong, secure environment at home and abroad, to the benefit of communities around the world. His message reminds us that we are all connected and that choosing to uplift each other has ramifications that go well beyond our own communities. When Sargent Shriver spoke these words, he was in a unique position. He had been the first Director of the Peace Corps for three years, having built the institution from the ground up. He was also settling into his tenure as the head of the War on Poverty, creating the Office of Economic Opportunity and designing the programs it would administer (Job Corps, Head Start, Upward Bound, Community Action, VISTA, Foster Grandparents, and Legal Services, among others). Being in these two leadership positions, one international and one domestic, gave him a unique perspective that few political leaders enjoy. From this one-of-a-kind vantage point, he was able to illustrate that committing to empowering people who need support, wherever they may be, elevates us all, and results in greater prosperity, security, and trust. We invite you to read the speech we chose for this week's quote, which includes many powerful moments, and also highlights Sargent Shriver's quirky sense of humor. And subscribe to receive our Quote of the Week by email! "There is a Wind Coming"